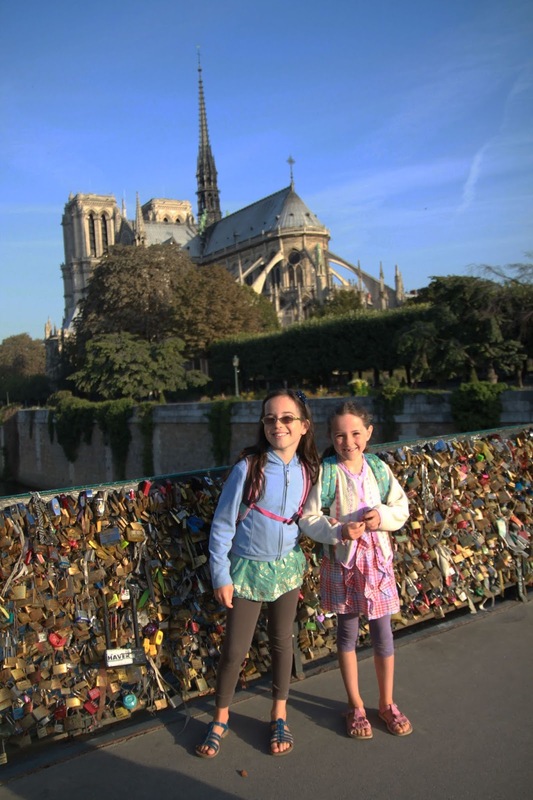 And so, I feel heartbroken about the burning of Notre Dame in a way that is unique to me and my family, and also completely universal to all those who love Paris and Notre Dame. Really, I know my grief is nothing special, but I feel it personally nonetheless. I don't think there is another building in the world whose destruction would cause me such grief other than my own house, and even then...my house is no Notre Dame. Luckily, both of my close friends who lived right by the cathedral on Ile de la Cité have moved. My best French friend just moved with her family of five and all of their household belongings and artworks to the 6ème arrondissement. 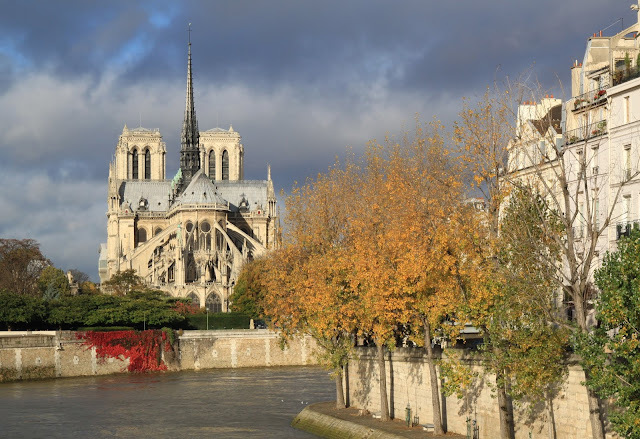 And we, who were just across the tiny bridge from the back side of the cathedral, left our apartment with our Notre Dame partial view for the 5ème arrondissement about 4 years ago. For this, and for the fact that there has been no loss of life or injury, I am profoundly grateful. But profoundly sad to see the church burn. As I type this, I'm watching the live stream feed from my home in San Francisco, and I simply cannot stop crying. This photo of the fire is taken from an angle that shows my previous apartment in the center -- looking as if it were in the heart of the fire, surrounded by the licking flames. In fact, it's a trick of perspective, and the flame is where the spire used to be, while the building behind it is still safe. But it's a pretty scary and upsetting way to look at my beloved Paris former home. From our Ile St. Louis apartment, we could see the spire of Notre Dame. How devastating to think this view is now gone. That this cathedral is now gone. I love -- loved -- this building so much that I have literally tens of thousands of photos of it, in every season, from every angle, with every visiting friend. The following are the photos taken just on my latest stay in Paris alone, this past summer. I've never taken the building for granted and am -- was? -- almost physically, pathologically unable to pass by it without taking a photograph. The views from the cathedral are also gone, unless (and until?) we can ever enter and climb the towers again. I hear not only from the news but from my friends in Paris -- both French and American, residents and tourists -- that people are lining the streets singing hymns in solidarity. The Catholic church has called upon all of Paris's churches to ring their bells, so all the city's bells are ringing simultaneously, with a solemn, heartbroken cacophony. Napoleon led the charge to save and revive this church once before when it was near ruins after the French revolution, and perhaps it will rise again. But so much is lost, including the 17th century organ, many statues, paintings, and quite possibly (probably?) the amazing stained glass windows. Perhaps even the stone shell of the building itself. The truth is that I will probably not see the inside of this cathedral again in my lifetime, even if they do try to rebuild. I'm hoping that my kids will get to visit Their Lady again, someday, to revisit their childhoods in the shadow of this marvelous, heartbreakingly beautiful, awe-inspiring architectural wonder. 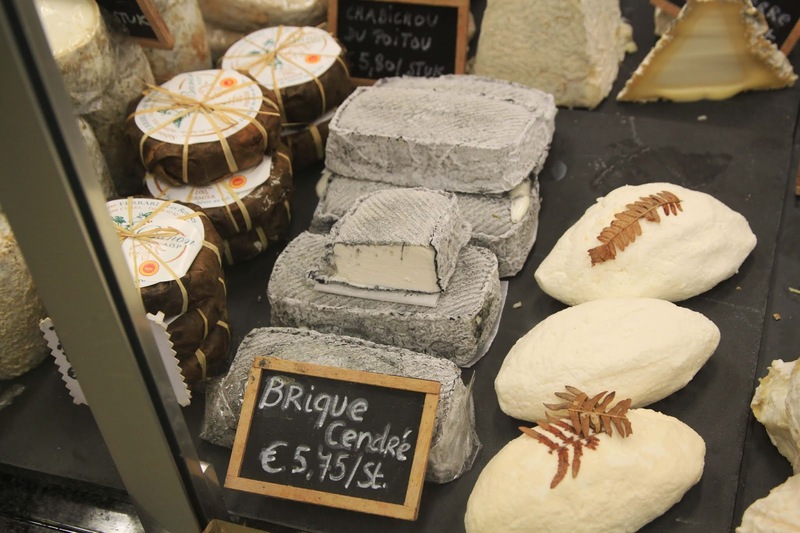 Brique Cendrée is a slightly generic name, since the words mean "Ashed Brick" and could, really, refer to a host of ashed-brick cheeses. But in general, this is what you'll get: a goat cheese whose flesh is blinding white beautifully coated with black ash. More than just color contrast, the ash also helps dry out the liquid during the aging process, with the end result a smooth, creamy, spreadable cheese with a lemony tang. Honestly, I've been crying so hard all day, I barely have the energy to write about this cheese. But I can tell you that when I eat this Brique Cendrée (a while ago and not on this dark day! ), I enjoy it immensely, as does everybody else in the room, which is why I only have a little nubbin to show you by the time I can take a break from stuffing my face to snap this picture. Brique Cendrée is a lovely cheese, a happy cheese even, and one that certainly doesn't deserve to be associated with the day that Notre Dame burned. 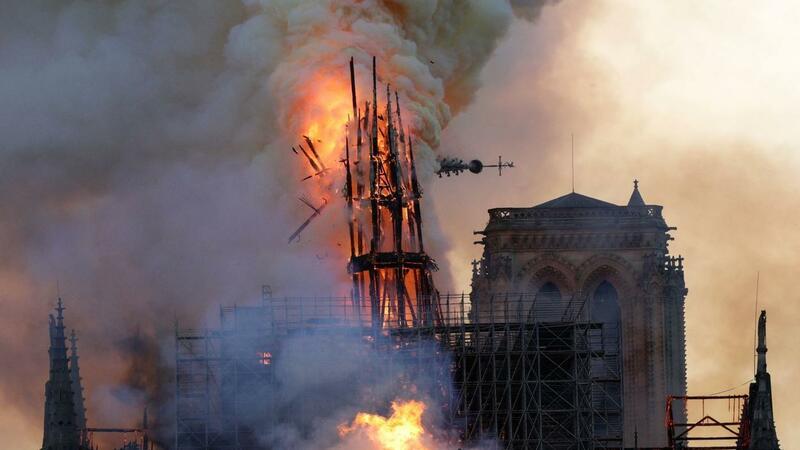 And yet, as cheese-based current event references go, it's got three big things going for it: ash covered, to represent the burning, the flames, the horror of so many works of art and so much architecture reduced to ash. It was actually eaten in the apartment with the view of the Notre Dame spire, now lost to the flames. And it's a brick -- at the moment I'm writing this, French officials have just declared that they believe they might be able to save Notre Dame's main towers and stone structure after all. Thank goodness stone doesn't burn. So the brick represents the beautiful stone structure left standing that will be but a skeleton for a while but, hopefully, the spine of a renewed Notre Dame, someday. Kazz this is so beautiful. Do not despair, she is not gone... the initial reports were more dire than the outcome. Au revoir, not adieu!